Whether you are rooting for the New England Patriots or the Los Angeles Rams, the Big Game brings lots of revelry. As New Haven personal injury lawyers, we see a lot of the other side by way of injury. Celebrating typically involves get-togethers with friends or at a local restaurant/bar. While you may have vacuumed the floors and put out your best 7-layer dip, these tips could keep you and your guests safe from personal injury. Keep an eye on guests. You want all of your party guests to make it home safely. Keep an eye on how many drinks everyone has had and if they are safe to get behind the wheel. If they aren’t you might consider calling them a cab or ride-sharing service so they make it home safely. No tripping. Make sure your walkways and stairs are free from any ice and snow that may be a slip hazard. The same goes for inside. Make sure cords, rugs, etc. are free from heavily treaded walking areas. Clean up any spills right away to avoid a slip. Safe snack. If you are grilling or bbqing make sure you have cleaned your surfaces to avoid a fire and that foods are cooked to appropriate temperatures. 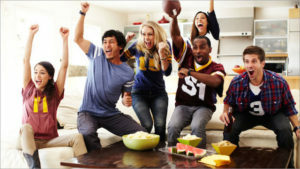 Whether you are hosting or a guest, the New Haven personal injury lawyers at The LoRicco Law Firm wish everyone a safe and fun Big Game weekend!